Like a lot of Spielberg's recent work, Bridge of Spies has an ever so there veneer of being...Spielbergian. And so, you love the movie, but never completely forget you are watching a movie. 85% engrossing, not 100% like, say, Sicario, which is a teleportation device to altered states within another dimension. 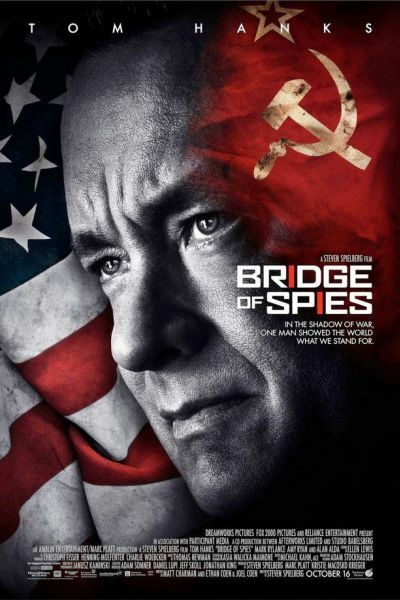 I had no idea Bridge of Spies was co-written by the Coen brothers. Interesting. And Mark Rylance is, as always, amazing. He seems the embodiment of a terry cloth robe after a warm bath: entirely unpretentious, yet serving this particular purpose better than anything imaginable and in the most reassuring way. It's a great film, yes, and you'll enjoy the heck out of it. Really satisfying. No "Oscar talk" here, I would think, but yes, solid, plodding, and earnest, exactly like the main protagonists. With the exception of two f-bombs, which are well-placed and not gratuitous at all, it seems otherwise not only appropriate for kiddos, but necessary. A nice family film, one in which we see people standing by their convictions, on the side of right, despite any personal tolls. We spoke of it for an hour afterward in the car, and it's all the more inspiring because it is true. "Good on ya," as they say.